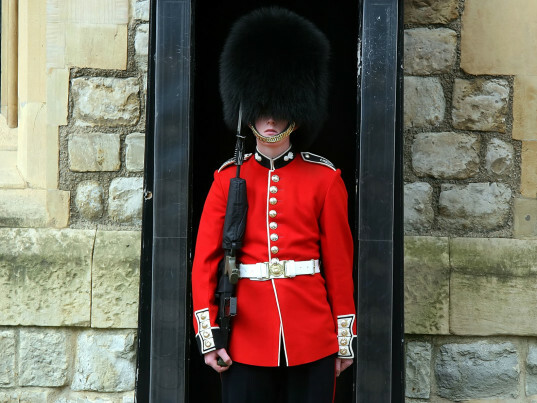 Buckingham Palace guardsmen are under ridicule, as animal rights activists implore the United Kingdom’s Ministry of Defense for turning bear skins into guardsmen hats. Guardsmen are internationally known for their red uniforms and tall furry signature hats (with uncomfortable looking mid-chin straps)- made from Canadian bear fur. Despite the presentation of faux fur and fur substitutes, the Ministry of Defense has refused to adopt cruelty-free alternative for their official uniforms. For the past 200 years, Britain’s Ministry of Defense has used bear fur to make their signature tall black furry hats for guardsmen, a tradition that began after Napoleon’s defeat at the battle of Waterloo in 1815. Modern concerns of ethical sourcing and animal rights have caused many to question the need to use real fur by the British government. Despite the availability of comparable cruelty-free synthetics and fur alternatives, the Ministry of Defense has refused to find a suitable fur-free material. Even big name designers such as Stella McCartney and Vivienne Westwood have offered to design fur alternatives in recent years, but the Ministry of Defense has declined. With their purchase of bear fur for their caps, the government is supporting the fur industry, while shirking support for finding alternatives. The People for the Ethical Treatment of Animals has found the archaic tradition and insistence of using bear fur to be laughable, since the Ministry of Defense is capable of spending millions of dollars toward high tech equipment and machinery.